..... under his command make him.."
On March 23, 1943, the 511th PIR closed at Camp Mackall, NC to join the 11th Airborne Division, under the command of Major General Joseph M. Swing. Following 17 weeks of Basic training, the 511th journeyed to the Fort Benning Parachute School for three weeks of jump training. It should be noted, with all the extensive training, no 511th PIR soldier who boarded a C-47 refused to make the jump. In December of 1943, the 511th returned to Camp Mackall for Advanced Training. The success of the Knollwood Maneuvers was very instrumental in the continued use of Airborne troops during the remainder of World War II. In January of 1944, the Regiment departed Camp Mackall for Camp Polk, Louisiana to engage in further maneuvers and prepare for overseas movement. In April of 1944 the 511th departed Camp Polk for Camp Stoneman, California. On May 8, 1944, the 511th PIR departed from Pittsburgh, CA on the SS Sea Pike with about 2,000 troopers that had been disguised as a "Straight Leg" infantry unit. The ship had been built by the Western Pipe and Steel Corp. and launched in Feb. 1943. The ship was 492 feet long, with a beam of 70 feet. She drew 29 feet of water and her steam engines pushed her at 17 knots. On May 28, 1944 the Regiment arrived at Oro Bay, New Guinea. While the 511th was in Strategic Reserve in New Guinea (May - October 1944), they conducted Airborne, Jungle and Amphibious training. On Nov. 7, 1944 the Regiment departed New Guinea by ship (USS Cavalier) for the Leyte Campaign in the Philippines. From November 18 to December 27 the Regiment participated in the Leyte Campaign in the Abuyog, Dulag, Burauen, Anonang, Manaraawat, Lubi, Mohonag and Anas areas. The 511th went into reserve in the Dulag area from Dec. 27th to January 21, 1945. From Jan. 22 to Feb. 2, the Regiment prepared for the forthcoming jump on Tagaytay Ridge and moved to Mindoro by sea and air. On the 3rd of Feb., the 511th jumped on Tagaytay Ridge, Luzon. From there the Regiment moved to the Paranaque and the Pasay area and fought in the Ft. McKinley and Alabang area until Feb. 19, 1945. On Feb. 11, 1945 Col. Orin D. Haugen (the Regimental Commander) (picture left). was mortally wounded and died of wounds on Feb. 22, 1945. 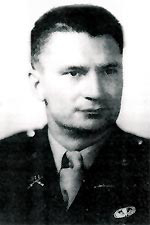 Lt. Col. Edward Lahti, the 3rd Battallion commander assumed command and remained in command until August 1947. On Feb. 23, 1945, in an effort to rescue the many prisoners (2,147) still under Japanese control at the Los Bonas prison, B-511th, plus the light machine gun platoon from HQ1, made a dawn jump on the prison at 0700 hours. Together with a simultaneous attack, by a Reconnaissance Platoon and Filipino guerrillas, the prison was captured. Amtracks (amphibious vehicles from the 672nd Amphibious Tractor Battalion) were used to transport the prisoners to safety. The plan envisioned the immediate evacuation of all prisoners and military personnel to the security of the Manila area (picture right). It was almost a textbook operation, no fatalities were suffered on the entire mission and all prisoners were rescued. The Regiment fought in the Real, Mt Bijiang and Santo Tomas areas from March 4 to March 24, 1945. From March 24 to April 11, 1945, the Regiment less the 3rd Battalion, operated in the Bauen and Batangas areas as 6th Army reserve. During this period, the 3rd Battalion was attached to the 188th PG and fought in the Sulac, Sapac, Talisay and Malaraya Hill areas. From April 12 to May 4, 1945 the 511th fought in the Lipa and Mt. Malepunyo area. In May 1945, base camp was set up near Lipa, Luzon. On June 23, 1945 the 1st Battalion and Companies G and I, boarded troop transports, from the 317th Troop Carrier Group, at Lipa Airstrip and dropped by parachute near Aparri as part of the Gypsy Task Force. The 511th PIR sustained a total of 289 killed and/or missing in action causalities during the Leyte and Luzon Campaigns. On August 11, 1945 the Regiment departed Luzon by air and were flown to Okinawa. On August 30, 1945 the 511th arrived by air, at Atsugi Air Base near Yokohama to occupy the city and guard the docks from which the peace delegation left to go to the USS Missouri and the signing of the Armistice. On Sept. 16, 1945 the 511th moved to Morioka, Japan to begin the occupation of Iwate and Aomori Prefectures in Northern Honshu. The 511th would remain in Japan until 1949. 511th PIR - Photos of 1/Lt Charles L Hayden.